Axion Power International Inc (OTC Bulletin Board: AXPW), the developer of advanced lead-carbon PbC® batteries and energy storage systems, today announced that it has received an order from Norfolk Southern Corp (NYSE: NSC) for PbC batteries for use in a battery-powered locomotive. Who knew that lead-carbon batteries would make such a fuss? Furthermore, who knew that it would be the rail industry that would lead the way for automotive and transportation in this arena of advanced carbon electrodes? 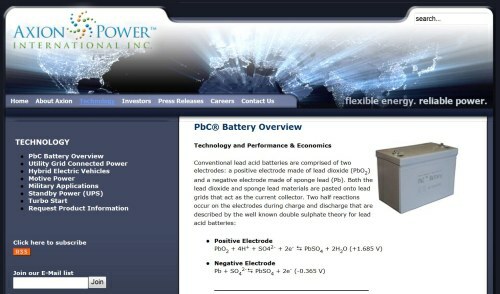 The use of lead-carbon known as PbC®, according to the Axion Power news release, is proving that nano-technology can produce lead-carbon electrodes with greater acces to its energy density; and, in concert with old-fashioned lead-acid in a battery, should be taken seriously. Fact is, a PbC battery is far cheaper than lithium-ion; and this first order to Norfolk Southern (NYSE: NSC) is setting a precedent as to its viability and affordability. For the record, Norfolk Southern stock made a pop to the upside today. Earnings per share of $1.23 noted yesterday beat analyst estimates by 11 cents. And this new technology will surely contribute again and again toward its bottom line. Axion Power said this first $400,000 purchase order is part of a $475,000 total purchase order, that will be used in the commissioning of Norfolk Southern's NS-999. The total purchase order will be shipped and deployed in the next 90 – 120 days. To date, this is the largest single PbC battery order that Axion has received. While no further details were disclosed, Axion Power Chairman & CEO Thomas Granville commented, "We have been working with Norfolk Southern for two and a half years, and we are very pleased that this first hybrid 'switcher' yard locomotive, to be run completely on PbC batteries, will soon be in service. We have been moving on a parallel development path with respect to supplying batteries for the first NS 'over the road' locomotive. This larger, more powerful, unit will require approximately twice the number of batteries as those to be shipped for the yard 'switcher' locomotive. High-performance PbC batteries are ideally suited for hybrid locomotive applications due to their high charge acceptance, fast charge and discharge capabilities (important in regenerative braking), and their inherent ability to equalize voltage when utilized in large string configurations." Granville continued, "Of course PbC batteries are also very stable and safe because of the close construct similarities they share with lead-acid batteries - a chemistry that has been safely deployed for more than a century. Unlike some of the batteries being used in various vehicular applications, PbC batteries operate safely at all temperatures; are 100% recyclable; and are priced substantially below the cost of some of the more highly publicized exotic battery chemistries. We feel these attributes are becoming more fully appreciated by our customer base in general, and by NS in particular. As for a strategic partner, you couldn't ask for one better than NS. We anticipate a long and mutually beneficial partnership as they move forward with their hybrid locomotive strategy." For the record, a yard switcher locomotive, or 'switcher', is used in a train yard to assemble and disassemble long trip over-the-road trains. Additionally it is used for the general movement of railroad cars around the rail yard. I’ve written about this technology before, but it is refreshing to see technology actually mass produced and placed into service. One are that I would like see is the stop-start systems for automotive. Read: Axion Power (OTCBB: AXPW) advancing battery tech into micro-hybrid vehicles and Axion Power to improve stop-start systems with new PbC battery electrode. The rapid charge/discharge capabilities of the PbC® battery fit the requirements for hybrid electric vehicle applications. It offers comparable performance at a significantly lower cost when compared to other advanced battery technologies. In addition, the PbC® battery will also offer more energy than advanced supercapacitors at a fraction of their cost. Think about it. A stop-start system requires a separate battery. Now, a high-cost vehicle like Buick may afford the luxury to charge extra as with the eAssist™. However, taking that technology to lower-scale vehicles may not be cost effective. Now envision a stop-start in say a Chevy Cruze which my wife drives. Now use a PbC® battery technology that allows fast recharging, great energy storage density, etc. Now you have condition whereby electrification, albeit light in this case, can contribute immensely to the MPG rating especially in city driving. After all, it is the stop and go driving of the city that wastes the most gasoline and contributes immensely to air pollution. Sure, it may not reach the levels required for 2025 mandates, but it buys time, reduces fuel consumption and cleans up the air, at least to some degree. Axion has thus developed and patented what I consider the next generation energy storage device, which is why it won the prestigious Frost & Sullivan Technology Award for North America in the field of lead-acid batteries. According to Frost & Sullivan, Axion's new PbC® batteries have "the potential to revitalize the lead-acid battery industry by breathing new life into an established technology that is not well suited to the requirements of important new applications like hybrid electric vehicles and renewable power." Fact is, Axion Power International, Inc. (OTCBB: AXPW) is the industry leader in the field of lead-acid-carbon energy storage technologies. Unique to its development is the feature that this new battery technology is the only class of advanced battery that can be assembled on existing lead-acid battery production lines throughout the world utilizing Axion's proprietary carbon electrodes. Axion's future goal, after filling their plant's lead-carbon battery production capacity, is to become the leading supplier of carbon electrode assemblies for the global lead-acid battery industry. This battery, which is patent protected by Axion, has some amazing characteristics. It last 5 times longer than any other lead acid battery, including ,AGM types. It simply does not have the dynamic charge acceptance issues of other lead acid batteries. Now they discover that if you string them together ( like for a locomotive engine or their PowerCube) the batteries self equalize the power without an expensive battery management system. Terrific product with a Huge future.